The front cover of “The Little Zen Companion” by David Schiller. Below is a summary of the week's pursuits. Please feel free to comment or email us for further information. The Little Zen Companion is a staple of the ELT library. Its motivational teachings are invaluable, and we are looking to print the contents in ELIA Frames. This week we moved our conversations forward with Workman Publishing. They own the rights to The Little Zen Companion and had some additional questions for us regarding sales outside of the Kickstarter. We'll keep you updated on our discussions. We are excited to be working with Allen Bromberger of Perlman & Perlman, LLP. He is a nationally recognized leader in the social entrepreneurship ecosystem. We met Allen at the Social Venture Network - Investors Circle conference in Brooklyn in December of 2018. He served on a panel about term sheets and social impact. We attended assuming that we would review best practices with respect to traditional term sheets. Instead, Allen and Teresa Pahl of Hanson Bridgett LLP led a discussion about how one could include social impact terms in a terms sheet and how they could benefit both side of the negotiation (both the company and investors). In short, by aligning the expectation of both parties behind future milestones, social impact goals are not just more achievable, but they are an opportunity to focus the company with respect to its social mission. Given that ELIA Life is a PBC, we sought a legal representative who understood corporate law, not for profit law and PBCs (which are a new hybrid). We met with Allen this week to begin the relationship and to begin collaboration. We will continue to consult with Paul Oakley, our lawyer for over a decade, but he is pursuing his own entrepreneurial endevours and encouraged us to engage Allen. The team had a kick-off conference call about the TouchPrinter with our engineering team at Simplexity PD. Simplexity was recommended to us by our partner, HP, which collaborates with them extensively. We chose Simplexity in large part because many of the Simplexity engineers worked at HP for a decade or more. They continue to do so from outside HP. Their experience will be invaluable as we integrate HP components into our printer. (We have an exclusive license from HP for us of the components). Of note, Simplexity's offices are right acrosse the street from their former HP office. We also chose Simplexity because of their company ethos. They share and demonstrate the same core values to their community as we do. We expect the printer to be available for sale in Fall 2019. If you are interested in purchasing a printer, please send us an email. Check-In Session at NEW INC.
As social impact community members at the NEW INC. incubator, Byron and I attend entrepreneurial programming. This Friday we have our first check in of the year. These check-in sessions are a great opportunity for us to practice pitching and also evaluate our recent milestones. Our peers and mentors share their perspectives and insights, offer assistance and ask tough questions. It's awesome. Without a vehicle such as these, getting perspective on our efforts is much more difficult. Through these sessions, we advance with focus and intention. We had a discussion with Evrim Oralkan, one of the founders of Collecteur, which provides digital public access to private art collections. They too are a PBC, and at NEW INC, and as such, they are kindred spirits. Their view of work, public good and the service a compamy can give to society is evolving much like ours. What does it take to build a movement? What does being a PBC mean? How can we use being a PBC to further our mission? If one could rise about IRS distinctions about for-profit companies and not-for-profit institutions, how would a for-profit company serve its community? How do we become a better PBC? We both believe that PBCs are the future of business and, in many ways philanthropy. How do we help make that happen? A red shirt with “LOVE” in ELIA Frames. 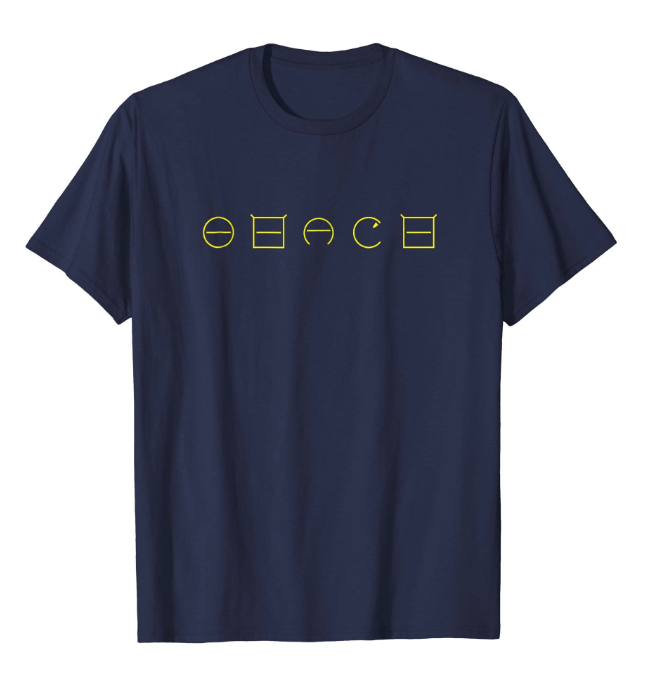 A blue shirt with “PEACE” in ELIA Frames. On the Thursday before the holiday break, I awoke with a kidney stone. Holy cow! It was painful. In the doctor's office, I read about an article in Money magazine ablout Merch Amazon, where people sell design intensive T-shirts. Amazon handles everything but the design. I've been wanting to wear ELIA T-shirts with funky saying on them. So over the holiday break, from the comfort of my in-law's couch, while the kids learned how to build with Legos, I learned the basics of Adobe Illustrator. With it, I designed a few shirts and posted them on Amazon. They have words in ELIA Frames, words like love and peace. They could have sayings of your choosing. For example, one person requested a shirt in ELIA Frames that says "All leaders are readers." (Harry Truman) I made one with a quote from Hannibal and one with "Never Quit!" on it. I'm looking forward to wearing these as power t-shirts; they will be something that will set the tone for my days but not intimidate those around me. Both new designs are working their way through the Amazon approval process. Search on Amazon under ELIAFrames for the list of shirt designs we have posted. We'll try to post a new shirt a day. Ping us if you would like a shirt with something specific on it. We'll design it, post it for you, and send you a link. Sharing our creative assets (testimonial videos and the game).